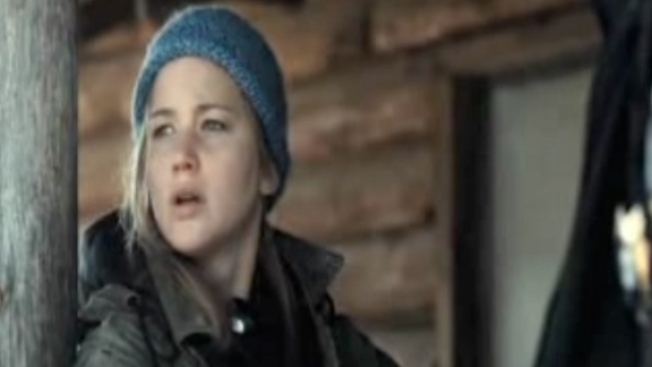 "Winter's Bone," the big winner at this year's Sundance Film Festival, stars Jennifer Lawrence as Ree Dolly, a 17-year-old Missourian who must care for her younger siblings and her sick mother. The family's fortunes take a sharp turn for the worse when Sheriff Baskin (Garret Dillihunt once again being way underused) stops by to inform her that her meth-cooking, bail-jumping dad put the family's house and land in the Ozarks up for his bond. If Ree can't find him soon, she and the family will be left homeless in the raw witner of the Ozark Mountains. For the next hour, we follow Ree as she visits a string of her father's associates and relatives in an effort to learn his whereabouts. But each visit is like the last: she shows up somewhere she's not welcome and is then warned not to pursue her father's disappearance by an inexplicably angry person after another. Director Debar Granik, who along with producer Anne Rosellini adapted the script from Daniel Woodrell's novel, does a nice job of establishing the setting and offers subtle but clear clues as to the harsh realities of the life Ree is living. It's a bleak existence fueled by squirrel -- and possibly dog -- shot in a foggy variety of blues and grays. The dialogue is appropriately terse, with more left unsaid than said, as when Ree tells Teardrop, "You always have scared me," and he responds simply, "That's 'cuz yer smart." These are not people prone to oration. Lawrence has deservedly been hailed for her performance at the center of this film, with the story putting her in nearly every scene as she tries to crack the mystery surrounding her father's whereabouts. Ree doesn't doubt for a minute that her father is a criminal, and she has little doubt that he's broken the Ozark omerta. All that aside, Ree insists that even among meth-dealing hillbillies, there has to come a point where she's owed the truth, if only for the sake of her mother and siblings. John Hawkes ("Me and You and Everyone We Know," "Deadwood") continues to compile an impressive resume, with his turn as Ree's Uncle Teardrop, bringing the film much of its snap. The mystery at the core of Hawkes' Teardrop is as compelling as the one at the center of the film. He smolders, growls and glowers both at Ree and in defense of her. "Winter's Bone" is very much about home and insular communities and boundaries and moral codes. In fact, if you pull back a little, it's not unlike a mafia movie, hidden in the flannel shirts, accents, rusty old pickup trucks and the dense woods. The look and feel Granik brings the film from the director's chair are well crafted, but the story that's been teased from Woodrell's novel has an uneven and frustrating pace and a finish that feels suspiciously tidy.